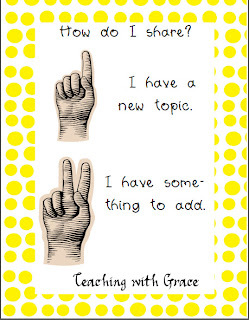 Teaching with Grace: Share and Share Alike: How to have kids sharing and discussing like pros! Share and Share Alike: How to have kids sharing and discussing like pros! Our Literacy Coach has been showing us these great clips this week of a teacher in Washington. Now, while we teaching Kindergarten and this awesome lady teaches 5th grade, our grade level has definitely found some new strategies to use for next year. I love how she has the small groups get together and work together to vocalize and work out what they want to say before they get to whole group sharing.... Oh and the oral summary! Love the kids who could accurately quote from text too! I looooove the hand signals!!! Check out the freebie at the bottom of how I'm going to use this next year! She is one of my new heroes for making ESOL kids feel included, have self esteem, and differentiate for them without them even doing it! Love, love, love that!!! Thank you so much for stopping by! I really hope that you take a moment to watch these quick clips!